Visit the Page Manager by selecting it in the app menu or by visiting the Dashboard and selecting it there. 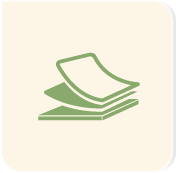 Use this app to create new pages for your website. Edit or delete a page or edit page info (title, meta, keywords, URL, etc.) with the icons (D) at the far right. You also can edit page info by clicking its title (E). Select an option from the SELECT FOLDER dropdown menu (F) to access a specific set of pages. Return to this page by clicking VIEW ALL PAGES (H) from any page within the app. Click NEW PAGE from any page in the Page Manager app. Enter the URL of the new page into your browser and hit the "Return/Enter" key. If you are creating a new page, SELECT A PAGE from the PAGE LAYOUT OPTIONS (a set of pre-built page templates is included in your website package). The layout title will turn red to indicate the layout has been selected. Enter the page TITLE and URL (these fields will auto-fill if you create a new page by typing the URL into your browser). Select an option from the URL dropdown menu to place this page inside a folder (optional). 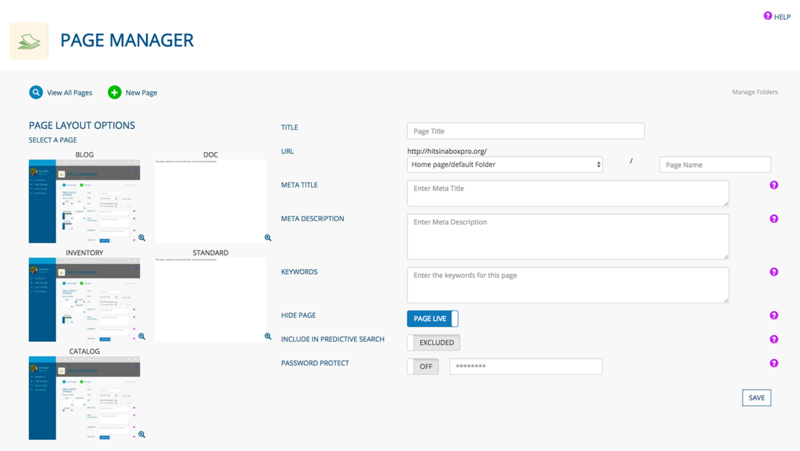 The SEO Manager generates an SEO report for every page on your website. Items with a red circle indicate they need immediate attention. Yellow denotes a lesser priority, and green items are good to go. 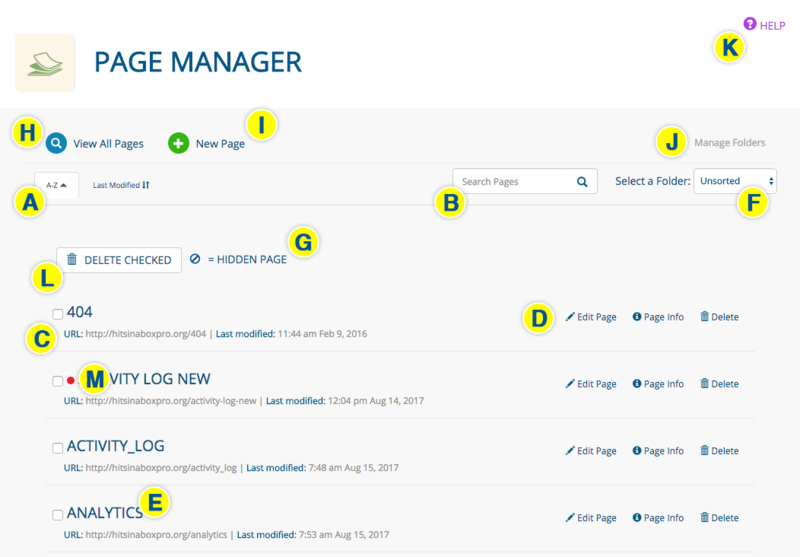 A new report is generated every time you visit a page in the /admin area of your site. Each page contains four key Google Analytics metrics for the page you are viewing. 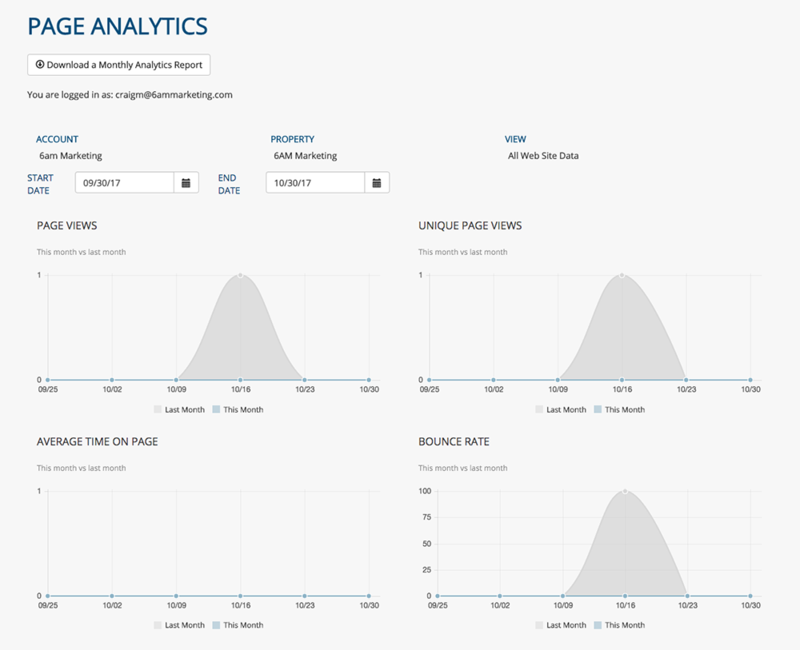 You download or print the report by clicking the DOWNLOAD A MONTHLY ANALYTICS REPORT button. If you do not have access to your Google Analytics account, email 6AM Marketing to request it.